"I will love and miss you forever. See you on the other side, with God's hands to guide us. Love you Roseann!" Roseann Ritter, 59, of Cheyenne passed away October 25, 2018 in Cheyenne. She was born February 20, 1959 in Warren, MN to Clifton and Patsy Johnson. She married Thomas Ritter on August 10, 1991 in Cheyenne. She was an Adobe Certified Expert and a product photographer for Sierra Trading Post. She was baptized and confirmed at Black River Lutheran Church in St. Hilaire, MN and was a volunteer for the Public Relations Committee for Cheyenne Frontier Days. She loved traveling and taking photos of mountain scenes, nature, family and friends. Volunteering for Cheyenne Frontier Days was her passion, as she loved photographing the rodeo action! Some of her work can be found on the CFD website, photos section. She is survived by her husband, Tom Ritter of Cheyenne; daughter, Amanda (Danny) Champlin of Mt. Juliet, TN; grandchildren, Taylor and Lincoln Champlin; father, Clifton Johnson of Mission, TX; siblings, Ramona (Collin) Wickstrom of Chisholm MN, Edie Johnson of Maple Grove, MN, Dallas (Arla) Johnson of Sequim, WA, Joe (Tammy) Johnson, Mooreton, ND, and Les (Teresa) Johnson of Foley, MN; and many nieces, nephews, relatives and friends. She was preceded in death by her mother, Patsy Johnson and niece, Sueann Wickstrom. In lieu of flowers donations may be made to Cheyenne Regional Foundation C/O Cancer Center or the CFD Volunteer Crisis Fund. Memorial services will be held at 4:00 p.m. Friday, November 2nd in the Lakeview Chapel at Schrader, Aragon and Jacoby Funeral Home, followed by a gathering in the Schrader Reception Center. 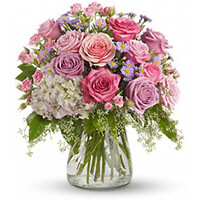 To send flowers to the family of Roseann J. Ritter, please visit our Heartfelt Sympathies Store. My deep deep condolences to the Ritter family: May you reflect on the precious memories of your loved one. I would like to share what helped us when our precious daughter died and later when my precious husband fell asleep in death as well do to cancer. I appreciated the calls and visits from all over the U.S. but I recall just sitting down and reading different Scriptures and meditating on them. It was so comforting to read that God cares for me personally... (1Peter 5:6, 7). Yes, He cares, He sees our pain. And, He Jehovah God will in His due time do away with All sicknesses & death (Isaiah 33:24 & Isaiah 25:8). He is indeed a God of comfort. Oh, wow He promises the hope of seeing our precious loved ones again (John 5:28, 29) and says where (Psalms 37:11). He always keeps His word. I hope that these few Scriptures were of some comfort to you as they were to me. I will love and miss you forever. See you on the other side, with God's hands to guide us. Love you Roseann! Our deepest sympathies! Sending love and prayers! You're in our thoughts and prayers. Love you. The Johnsons, Pearl, Dwight & Bonnie, Neil & Rose, Lyle, and Families. Went out the evening of Oct 25th after hearing of Roseann's passing. Took a camera and got this sunset and clouds photo.